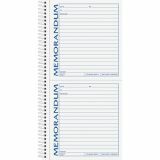 Ruled memo format with reply check boxes. 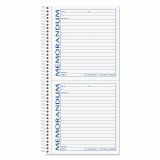 TOPS Memorandum Book, 5 x 5 1/2, Two-Part Carbonless, 100 Sets/Book - Carbonless paper in Memorandum Book makes an automatic copy of memos. Preprinted prompts include date, to, signed, "re:" and boxes for "Please Reply" and "No Reply Needed." White originals and canary duplicates are printed in blue and red ink. 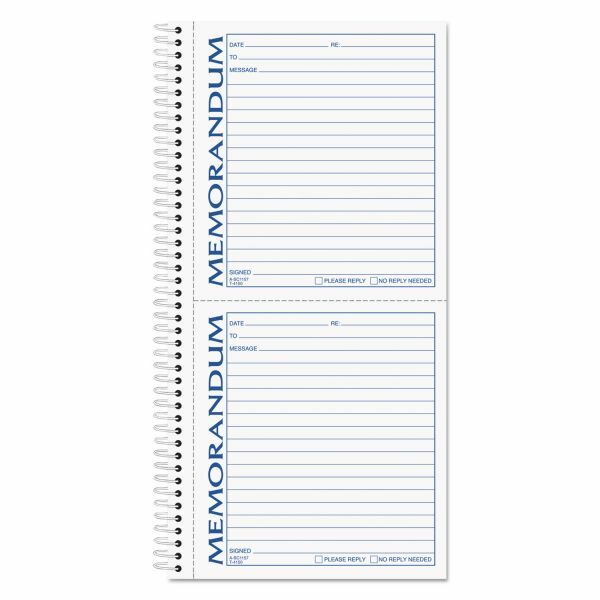 Memorandum Book originals are perforated for easy removal. Bound-in duplicates are follow-up copies. Each form in spiralbound book measures 5-1/2" x 5".